We’d love your help. Let us know what’s wrong with this preview of A is for Activist by Innosanto Nagara. A is for Activist is an ABC board book for the next generation of progressives: Families that want their kids to grow up in a space that is unapologetic about activism, environmental justice, civil rights, LGBTQ rights, and so on. To ask other readers questions about A is for Activist, please sign up. When I first read this book, I laughed out loud. Beautiful, radical, but... "Querying Qualities Quickly Quell Distortion" ??? "Not a good kids' book," I quickly dismissed. Also, the jargon-y language, in action, served as great discussion prompts with some of the older kids in the room. (The old When I first read this book, I laughed out loud. Beautiful, radical, but... "Querying Qualities Quickly Quell Distortion" ??? "Not a good kids' book," I quickly dismissed. Also, the jargon-y language, in action, served as great discussion prompts with some of the older kids in the room. (The older kids were not all 100% engaged in the book, but a few were, which I was not expecting.) We had some deep conversations. So, now I am going to get my own copy! I’m so disappointed because I’d seen this book on someone’s (real) shelves and jumped to reserve it at the library to see if I’d want this for giving new baby gifts. What a great idea! The most stars I would have given anyway is 3. This is a board book, so presumably geared toward babies, toddlers, and preschoolers, and their adults. The illustrations are colorful and interesting and while I’m not a huge fan of their style, I think many readers will like them, including young readers/l Not for me! This is a board book, so presumably geared toward babies, toddlers, and preschoolers, and their adults. The illustrations are colorful and interesting and while I’m not a huge fan of their style, I think many readers will like them, including young readers/listeners. However, the vocabulary is so advanced that while babies to preschoolers might enjoy the pictures and the cadence of the language, they’re not going to understand much of the text. Older kids will but they don’t need board books. However, I am such a fan of the idea, and I’m all for parents, teachers, babysitters, etc. adults enjoying kids’ books, that I could have forgiven the not so friendly for young kids vocabulary. Then I got to H.
That was it for me. Hot dogs, even vegan ones, aren’t really that healthy. And this is a book that touts rights for all varieties of humans, and I agree with that. But not only nothing about animals but a point is made to eat what is definitely animal derived cheese and probably animal flesh. What about non-human animal rights?! What about animal rights activists, most of whom are also human rights activists. Anyway, that lost me. I will never give or read this book to anyone, and certainly not any child. If I’m reading a book about activism it doesn’t have to mention animals but if it does it has to be for their rights, not for their use and abuse by activists and would be activists. I share the politics of the author, but I am a mom to two kids with autism and I need my kids' books to do something for them. This book is totally developmentally inappropriate for children. There are too many words on each page. And the words are way too complicated. There is no consistent rhyme or meter pattern for kids to anchor themselves in the text. The pictures don't always provide context. I would love to buy an alphabet board book--or any board book--that is engaging, developmentally ap I share the politics of the author, but I am a mom to two kids with autism and I need my kids' books to do something for them. This book is totally developmentally inappropriate for children. There are too many words on each page. And the words are way too complicated. There is no consistent rhyme or meter pattern for kids to anchor themselves in the text. The pictures don't always provide context. I've come home from work to catch my father-in-law brainwashing my kids with Fox News playing on TV so it's nice to finally be able to combat that nonsense with an over-the-top left-leaning screed like this alphabet book. 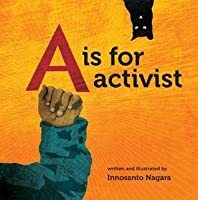 A former colleague posted a photo of a children’s book as her Facebook profile picture – A is for Activist by Innosanto Nagara. A board book about activism? Yes! My first read through of the book was choppy. It took me a couple of reads to get the rhythm of the words (it could also be that I have no rhythm). But as I continued to make the book part of our family’s reading rotation, I picked up the cadence and was able to have fun reading it aloud to my kids. On top of the lyricism of the text, Na A former colleague posted a photo of a children’s book as her Facebook profile picture – A is for Activist by Innosanto Nagara. A board book about activism? Yes! My first read through of the book was choppy. It took me a couple of reads to get the rhythm of the words (it could also be that I have no rhythm). But as I continued to make the book part of our family’s reading rotation, I picked up the cadence and was able to have fun reading it aloud to my kids. On top of the lyricism of the text, Nagara’s illustrations are incredibly vibrant and really call for the reader/listener to interact with each page. This is such an important book, especially for families who value progressive ideals. Initially, I thought it might introduce topics that were too big for little ones to grasp. But then I quickly thought, “How else will they learn?” My kids absolutely go crazy for this book. It introduces terms like activism, democracy, justice, feminism, and freedom, all while teaching the alphabet. The pictures are thoughtful and yet, like all board books for young readers, allow for search and discovery. My kids look for the black cat that appears on almost every page (a nod to the IWW cat?). One of my favorite things about this book is the diversity of people that appear on the pages. Young, old, different races, different genders, breastfeeding mothers, musicians, farmers, kids in wheelchairs – everyone is represented which serves as a good mirror for anyone reading along. A grand idea, but I think it lacks something in it's fruition. This reads like a board book for adults. Kids who are reading board books are not going to read this, nor will they be able to understand it. The picture book version makes way more sense but it still was weird to read. I don't think that the "A is for..." style is the best way to do this. All in all sort of a disappointment. 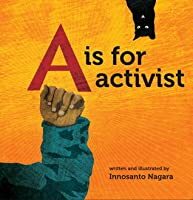 A is for Activist, written and illustrated by Innosanto Nagara, takes your classic alphabet book and adds a twist of political motivation. Written in a format usually meant to teach kids their ABCs, Nagara takes this intention of educating a step further. Each page follows a theme of civil rights and political activism, while promoting values such as peace, acceptance and independent thought. In emphasizing these values, Nagara also directly calls attention to contemporary topics in social justi A is for Activist, written and illustrated by Innosanto Nagara, takes your classic alphabet book and adds a twist of political motivation. Written in a format usually meant to teach kids their ABCs, Nagara takes this intention of educating a step further. Each page follows a theme of civil rights and political activism, while promoting values such as peace, acceptance and independent thought. In emphasizing these values, Nagara also directly calls attention to contemporary topics in social justice. From A to Z, each page is dedicated to a different value or movement, with colorful, emotive illustrations to match. Nagara covers everything from feminism, to LGBTQ rights, interracial tolerance, to environmental justice; and across it all, the ability to think critically: “Q is for Question/ Querying Qualities counter false assertions”. On the “K” page the words read “Kings are fine for story time/ Knights are fun to play/ But when we make decisions/ we will choose the people’s way!” with an image of two kids playing with toy swords. This page not only emphasizes revolution and resistance, and the danger of centralized power, but also counters gender norms by showing a little girl in pink pigtails playing with a sword. On the “R” page the words read “‘Radical Reds!’ the headlines said/ ‘Ruinous Rioters!’ the Rumors spread/ ‘Rabble Rousing Riff Raff…’/ …Really?’”, mocking misguided, public perceptions of activists and protesters. The image shows a large crowd of people in solidarity at a candle light vigil, and many of the faces can actually be recognized as prominent, historical figures. Nagara, on his book’s Facebook page, provides a “Who’s Who” of the faces he illustrated, and they include Martin Luther King, Jr., Rosa Parks, Dorothy Day, Ella Baker, Cesar Chávez, Malati Choudhury and Leo Tolstoy, amongst many others. This book was originally written in English, but has been rewritten in Spanish as A de Activista by Martha González. The Spanish version still has the same illustrations by Innosanto Nagara and the writing follows the same themes of political activism and social justice, though some of the pages have been slightly altered to either facilitate translation, or call closer attention to Latin American society and culture. In both the English and the Spanish version, the “F” page is dedicated to feminism and feministas, however, the Spanish translation also dedicates the “F” page to Frida Kahlo: “F de Frida/ ¡F de foco que brilla como el futuro!/ Para las feministas fabulosas,/ Mujeres y niñas”. Also in both the English and the Spanish, the “I” page stands for indígena and immigrante: “Indigenous and Immigrant./ Together we stand tall./ Our histories are relevant./ An Injury to one Is an Injury to all”. The illustration shows a collage of eyes of people with all different skin colors, reinforcing diversity and unity, and the idea that it is every citizen’s duty to be vigilant and look out for injustices. Although the book is meant for ages 0-3, Rethinking Schools has suggested that it can even be used with older kids: “It could also be used as a prompt for older students to create their own alphabet books with a conscience.” This unique alphabet book encourages young readers to stand up for what they believe in, engage with their community, and become aware of the social movements going on around them, at any age. Nagara’s pointed social agenda is counterbalanced by the playful rhythm and rhyme of his writing. Throughout the book he maintains a light-hearted and positive tone that is at once kid-friendly and empowering. Shaya Tayefe Mohaje, in her online review titled “‘A’ is for Activist, ‘B’ is for a book you should read your children,” lauds Nagara for his use of “clever rhymes—à la Dr. Seuss—and an open love for peace and equality—à la Dr. Martin Luther King Jr.”. The book’s illustrations include images of children of a variety of races and ethnicities, as well as handicapped children in wheelchairs, to match Nagara’s call for diversity and tolerance. The children are all shown laughing, speaking, and marching with fists in the air, giving them full agency. Nagara visibly works to include under-represented communities and, according to a Publisher’s Weekly review, has stated that “The statistics on racial diversity alone in children’s books are appalling, not to mention gender, LGBTQ families, and progressive values in general.” Nagara challenges this norm and makes every child from every background a protagonist in his story, while teaching new generations the value of activism. I read it on a dare. Just to put it out there. Look, I get it. You want to teach your kids how to be tolerant and kind to everyone while being woke and ready to take on the world's problems. I get it. But how will this help? Not to mention how hamfisted and heavy-handed it is about its agenda. I mean, even the Doctor Suess books used an analogy to teach kids about sharing, environmental protection, etc. This book doesn't even bother. It's as subtle as a brick through a Starbuck's windows. Honestly? I read it on a dare. Just to put it out there. Powerful and simple rhyming board book that highlights big topics. It starts the ball rolling for conversations parents and caregivers can have with their child about people's rights. This book is propaganda for kids, obviously, which makes me a little uncomfortable, as much I agree with the opinions. However, that kind of discomfort-turned-into-honest-dialogue is exactly what's missing from children's books these days, so I applaud this one. It was pretty, but as a tiny board/alphabet book, the vocabulary is way too big and complex for any of the logical readers, without definitions to help. Awesome, beautiful, and fun! Big congrats to Inno for getting this marvelous book made. I absolutely love the message of this book. It teaches children about keeping open minds and taking action for social change. Also I'm very sorry to the librarians for getting ketchup on this book. This book caught my eye from the shelf at the library. 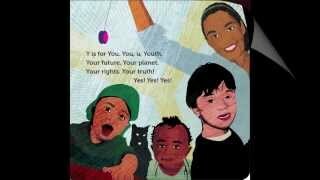 A board book on activism? I had to pull it out immediately and thumb through the pages. After a quick peek inside, I excitedly put it in our book pile and we checked it out. A is for Activism, written and illustrated by Innosanto Nagara, was an amazing find! The art in the book is beautifully unique and it manages to keep my toddler's attention - which is quite a rarity these days. It's wonderful when I stumble across something engaging and This book caught my eye from the shelf at the library. A board book on activism? I had to pull it out immediately and thumb through the pages. After a quick peek inside, I excitedly put it in our book pile and we checked it out. A is for Activism, written and illustrated by Innosanto Nagara, was an amazing find! The art in the book is beautifully unique and it manages to keep my toddler's attention - which is quite a rarity these days. It's wonderful when I stumble across something engaging and educational. I love the different topics that are touched upon: co-ops, grassroots, equal rights, LGBTQ, and peace marches. I feel like it could be a great way to introduce a child to these topics which could then lead into a deeper discussion if it piques their curiosity. My son is still too young to understand any of it, but he sees that I enjoy reading it to him and that makes him excited. It truly is a refreshing read! It's fun to read words that resonate and can be spoken passionately. The book goes through the alphabet and showcases words for each letter, so not only does it integrate the progressive themes, it also helps to teach the alphabet. And did I mention? There are cats to find on each page! It's an adventure to search for them! I can't wait until my son is a little older and can look too. I already added the book into our amazon cart to purchase. It's a brilliant book! "Open minds operate best / Critical thinking over tests / Wisdom can't be memorized / Educate! Agitate! Organize!" In a word: Yes. "A is for Activist" teaches children at a young age about oppression, how to be accepting of others, and how to live a healthy life. It uses the alphabet as a way to do this. This book is awesome! The illustrations make connections to elements that kids are familiar with, making these difficult concepts easier for children to understand. There also is a cat incorporated into each illustration, which is very interesting. The author uses alliterations throughout the book, creating a kind of rhythm "A is for Activist" teaches children at a young age about oppression, how to be accepting of others, and how to live a healthy life. It uses the alphabet as a way to do this. I loved the concept, the artwork, and much of the writing, which I thought was lyrical and would probably be fun to read to a child. I agreed with some other reviewers that in places the writing could be a little choppy and maybe could have benefited from additional editing. And it is a super biased book, but it doesn't bother me much because I'm also biased, and I think it's a valuable addition to the other perspectives present in children's books. I honestly don't know what to think about this one. Need to think on it for a while. What a marvelous little board book. It is a beautiful way to introduce your favorite toddler to the concepts of activism, diversity, environment, and other important issues.